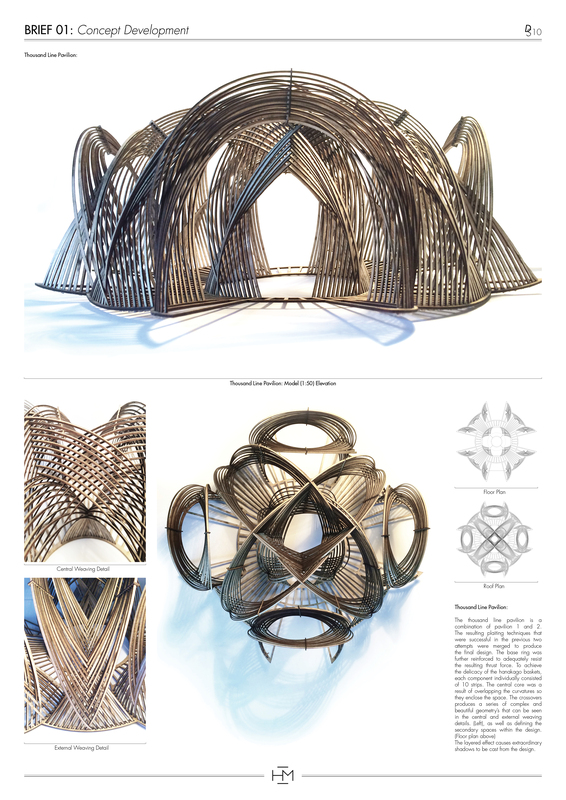 Inspired by Japanese basketry weaving, Twisted Pellucidity takes this technique into an architectural scale. 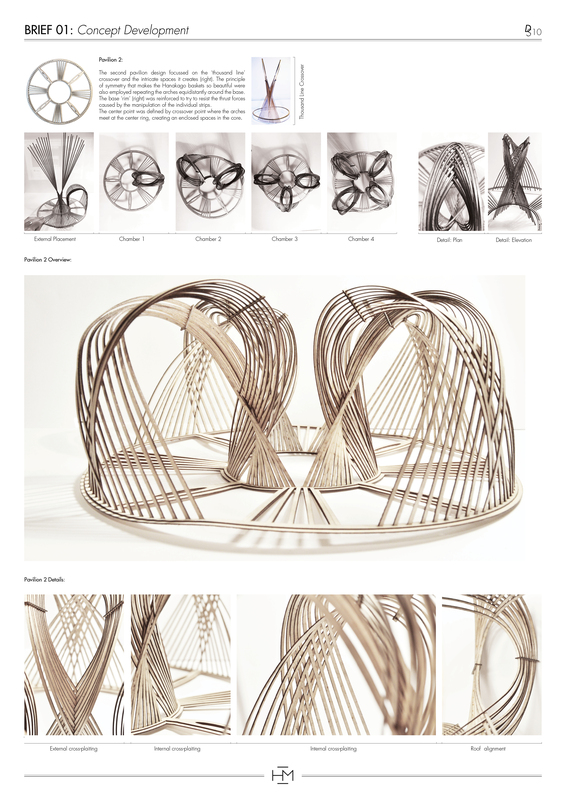 Through creating a set of twisted modules varied with a standard weave in between, the design flows between closed and open creating potential for naturally ventilated housing in hot regions of the world. 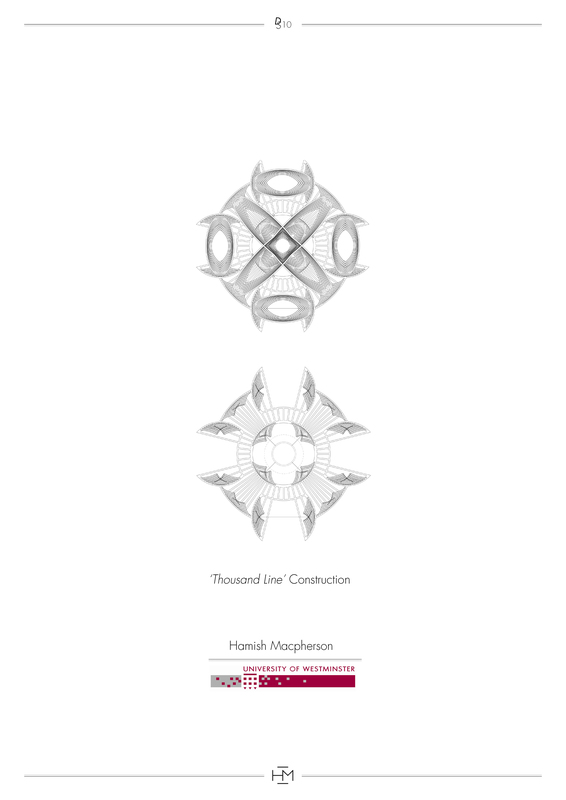 It has been designed for disassembly to ease transportation and enable adaptations of the size and shape of the design. Thanks to the module’s structural strength, very thin ply strips were used making the structure light and delicate whilst allowing elegant passage of light. Research: Material Properties. Physical and Digital Experiments. 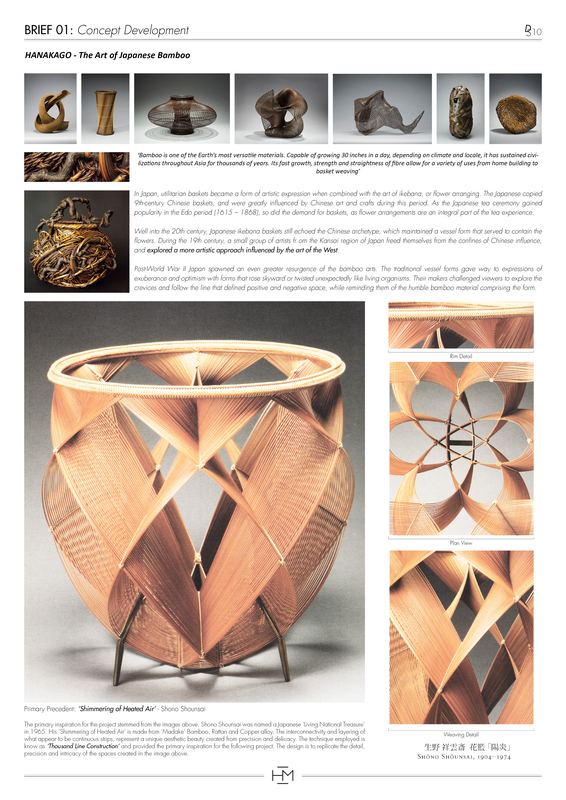 The project started with the exploration of weaving patterns and their strength and bending qualities. 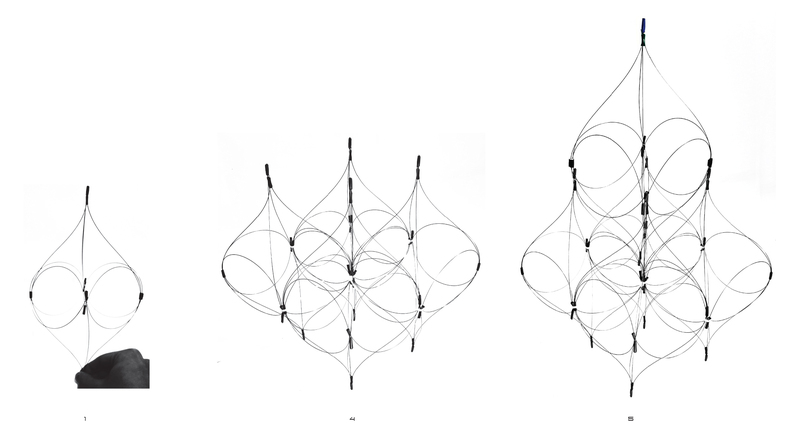 Through a series of experiments I have tested a number of single and double curvatures that could be potentially applied on an architectural scale. 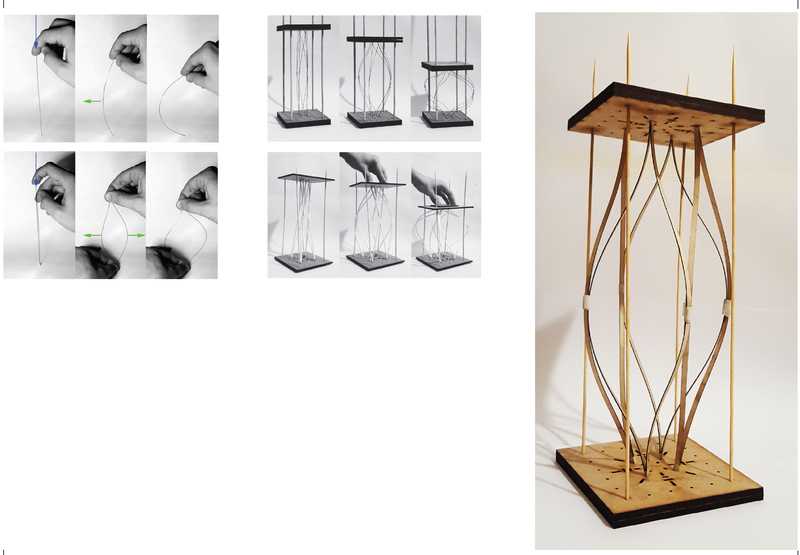 Since bending quality of plywood, whether as a woven sheet or as a singular strip, has always been of interest, I have started looking into combining both of those methods. Thanks to bending, large volumes can be created – which seemed ideal for potential enclosure areas. I have therefore decided to research further into the bend-active qualities of plywood. 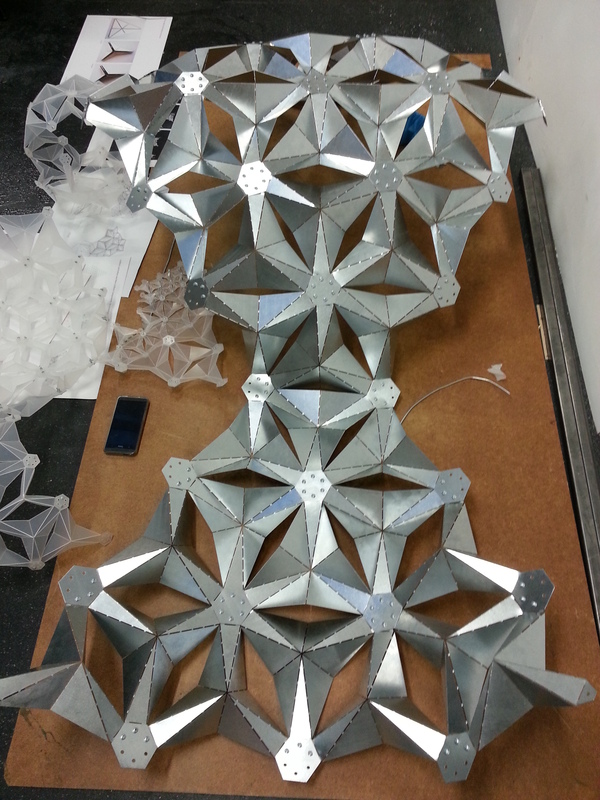 Starting with a single bend, I have developed the geometry into a triple – twist which created a very structurally strong, symmetrical module. Through Grasshopper scripting of the observed geometry of the physical model I have gained a thorough understanding of the behaviour of twisted strip of plywood which I then further enhanced and through a number of Kangaroo physical simulations I have gained a deep understanding of forces acting on a bent and twisted three times strip of plywood. Those experiments helped explain and understand why and how does a strip of plywood gain an extraordinary structural strength. Twisting and bending the strip showed a great impact on the properties of the entire module. Thanks to bend-active and torsional forces acting against each other, the module gains incredible strength in both tension and compression with its strength rising about 10 times in comparison to original elements. This allows for almost never-ending possibilities of use when arrayed in different ways. As I was particularly interested in how the action I have chosen affected the original material, the natural course of action was to test it in a larger scale as an array and combine it with the original research into weaving patterns and their properties. This has naturally created a Field Condition. Field Condition is any formal or spatial matrix capable of unifying diverse elements while respecting the identity of each. That leads to the overall shape and extent being highly fluid and less important than the internal relationships of parts which determine the behaviour of the field. 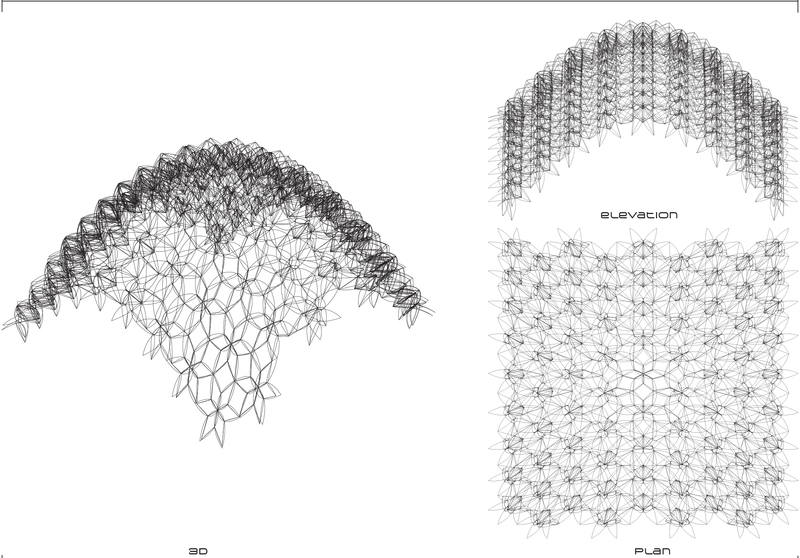 Modules can be added infinitely with the remaining texture woven in between creating a dynamic field condition and an architectural design by starting from the individual element, letting it grow incrementally and defining how it connects to the next one. Thanks to the overall qualities of the system, the final design became an unexpected result of adding modules and then connecting each the ends to create an enclosed circular space. This can vary in diameter until it reaches the structural strength capabilities of the chosen thickness of plywood. For 0.8mm strips the largest structurally stable diameter is approximately 1m. This could be larger for thicker and wider strips however this required further research. Assembly of the final model turned out to be time-consuming but rewarding. Due to great intricacy of the module and a number of connections, it took approximately 80 hours to complete the final model. Final Model ended up taking shape of a tower – large enough to fit myself in it. This process proved the Field Condition properties of the system allowing to create a variety of designs – displayed tower being one of them. Overall, it was a challenging but extremely rewarding journey which I am excited to draw further conclusions from in the second semester.